Almost certainly are the servers that do not support the increase of players for 6xp. same been like this for over an hour WTF can we get an extension in the xp event I just want to get a omen boom shot for crying out loud . Was in the middle of a public horde match when people started dropping from the match mid-sprint. Have not been able to do anything for the past hour now. Servers take a dump again? It’s showing I lost all my scrap, and I cannot sell anything. It’s just the servers being wonky. I’m hoping they get this fixed before the 6.66XP event disables. I got for the second time the error code 0x00000d1c i played 1 till 50 horde without getting xp for it. Inconcieble iron man also my bounty didnt came after finish the 50 waves and xp. Plz fix it coallition so i can play horde again. Back to the same error message when are you going to fix this problem??? One da y and it is right back to not being able to play. Just finished a 25 match, the game was being weird. I was getting “Match results taking longer than expected” every wave, and “Waiting for other players”. When we finished it did not show the XP screen. It was all 0. 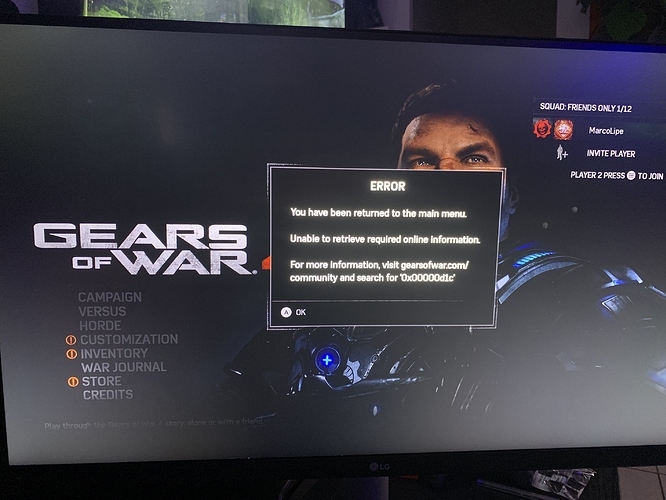 Now i have this error code 0x00000d1c every time i try to join a match. Got this error code for the first time today, along with a couple of friends who were also attempting to play Horde. My gamertag is Tm5k.